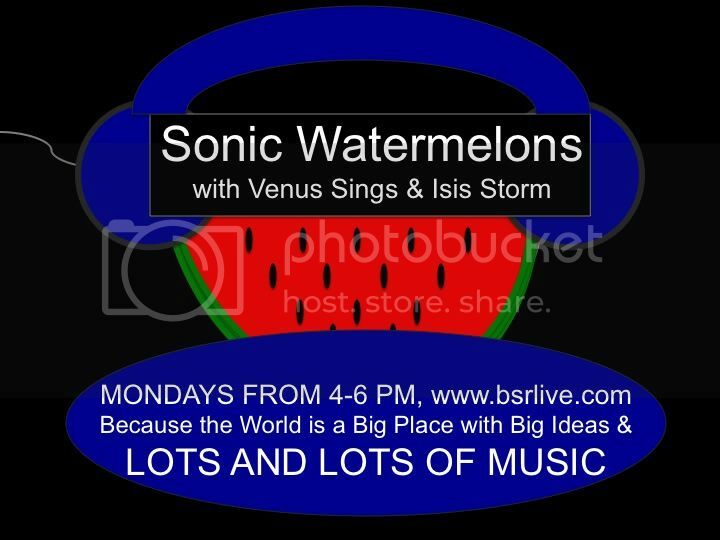 1) Click here to listen to the Wednesday, October 5 edition of Sonic Watermelons, which includes samples of music from Head-Roc, Spiritchild, and 5th Elament of Isis Storm – and details about today’s show and other community events. PROVIDENCE, RI – The Empower Providence Project is a multidimensional cultural celebration happening on Friday, October 7, 2011, beginning with community service and civic engagement and culminating with an evening performance in downtown Providence by Washington, DC based hip hop artist, Head-Roc; NYC-based hip hop artist and “freedom singer,” Spiritchild; and RI-based artists from the women’s performance group, Isis Storm. It is part of a movement to connect the public to artists and musicians who explore community issues in their work, and it comes at the same time as the Occupy Wall Street direct actions that have stirred up community members of all ages and backgrounds – and sparked similar “occupy” activities in DC, Boston, and here in Providence. Head-Roc is an independent musician who has gained most of his fan base through two decades of live performances and activism. He has been outspoken on issues of racism, neglect of communities of color, and inequities in urban school districts, and he regularly writes songs advocating for workers rights, environmental justice, and using music to grow political movements. Before his evening performance, he will speak to and perform for a rally organized by youth from RI Jobs with Justice, a grassroots community organization located in Providence. 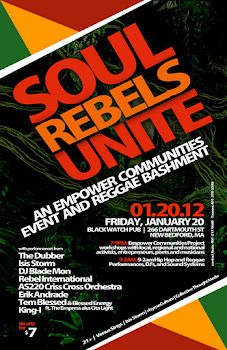 Spiritchild, who is from the south Bronx and Brooklyn, is also known for integrating activism and music. He uses his art to converse with his audience about the injustices facing the poor and oppressed, the dangers of climate change, and the need to take on environmental justice issues, in New York City and around the world. He is also an instructor in songwriting at several public schools throughout New York. Prior to his evening performance, he will speak to and perform for students and families of the Mount Hope Learning Center’s 21st Century After School Program in Providence. All of the festivities happen on October 7, 2011 and members of the RI-based artist collective, Isis Storm, will also participate along the way. Isis Storm is a group of women who use art, words and music to empower women and underserved communities, specifically through performances, workshops, and media projects. The group was founded by writer, DJ, and multimedia producer, Reza C. Clifton (DJ Reza Wreckage), and hip hop artist, poet and scholar-educator, Kalyana Champlain (5th Elament). 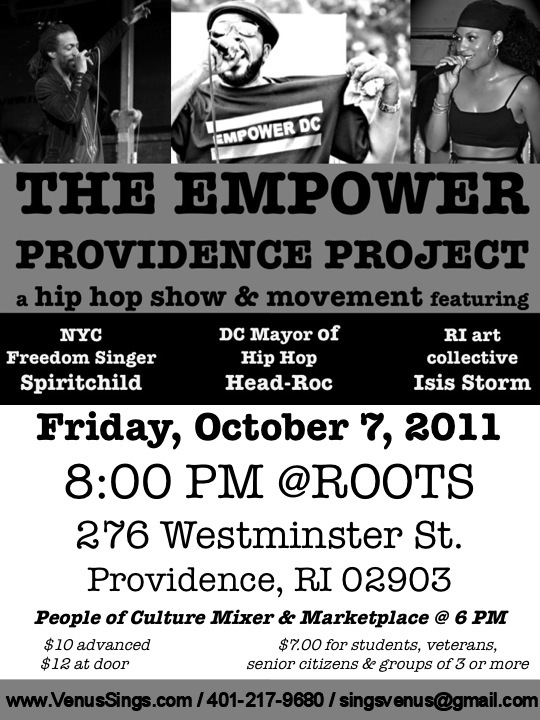 The Empower Providence Project culminates with performances from Head-Roc, Spiritchild and Isis Storm at the Roots Cultural Center, 276 Westminster Street in downtown, Providence, starting at 8:00 PM. The event is open to the public and attendees of all ages, and admission is $7 to $12 dollars depending on group rates, special discounts and whether tickets are bought ahead of time or at the door. Besides performances by Head-Roc, Spiritchild and Isis Storm, WRIU, 90.3 host, DJ Kellan, will also spin music, and there will be open mic opportunities sprinkled through out the evening. Click here to purchase (and print) tickets to tonight’s show or call (401)217-9680 to sign up for the group/student/special rate.